"Greetings to friends in Marmora. I grew up at Bonarlaw and attended grades 9-12 at Marmora High from 1953 -1957. Wonderful memories of Leonard Begley - Principal and Math, Helen Brady – French and Latin, Patricial Toal – English, Leighton McGinnis – science, Jean and Harry Jenkins – history. They were great years and mind opening experiences. We all lived in fear of Reverend Brownlee and Father Healey! They always knew about who had started smoking, had a beer before the school dance and the ultimate sin - dropped Latin. None of this boded well and you were definitely stigmatized! We had a pretty lively group – James Shannon, Bill Cronkright, Leona Hagerdorn, Rodney Mawer, Mike Doyle, Ken Stiles, Alice Mathews, Brenda Mckeown, Jane Glover, Dave Bedore, Jack Black, Bill Redcliffe, Barbara Neal, Marion + Bob Chrysler, Anna Lee Parkin, Robert Clemens, Judy + Sandy Fraser, Carol + Bob Jenkins, Sandra Meiklejohn, Dean Lavender, Paul Brady, Dale McTaggart and many others. Our football, hockey, volleyball and basketball teams were the best, winning many times over Madoc, Tweed and Stirling. 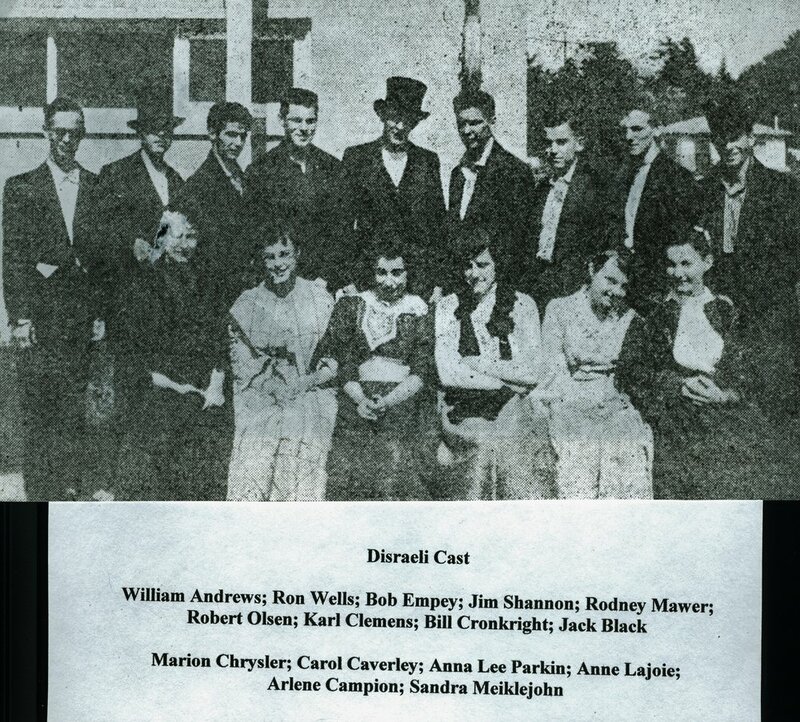 And then there was our blow out play in grade 12 – Disraeli – 2 performances – mounted by Patricia Toal . I was Disreali and Jack was one of my key ministers! We all had great fun. I especially enjoyed the MHF article on "My Uncle – Jack Black” by his niece “Janice Brown”. (See story below) Jack Black and Dave Bedore were my science partners – front row and definitely leaders. I will never forget the day our phosphorous experiment went awry and we set Judy Fraser’s angora sweater alight at the desk/table behind us. Brief high drama. Judy was good natured about it. I remember Jack as a very enthusiastic fellow with loads of energy. He always had at least 6 girls in a swoon with his charm and head of jet black hair. He stood out in a very positive way. If I recall correctly, he had an out of town connection in Campbellford on some weekends in grade 12. And boom – grade 12 came to an end and we all pursued life in different directions. Long live Marmora High memories. It was a great beginning to life in the modern world.Thanks again, with kind regards. " CLICK HERE FOR MORE ON MARMORA HIGH.